This post is “out of season” unless you count trips to the grocers as foraging. 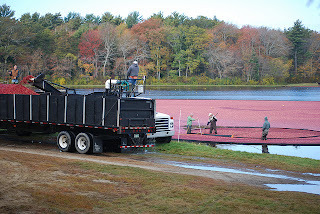 I suppose you could… The subject of this post (cranberries) are available there year round. But I would suggest getting out into the fresh air come autumn to fill a bag or bowl with cranberries you picked yourself. There’s a sweetness to what you harvest that has nothing to do with any sugars in the fruit. Common cranberries are a low growing bog or shoreline fruiting plant that is widespread across the cooler, temperate parts of North America. 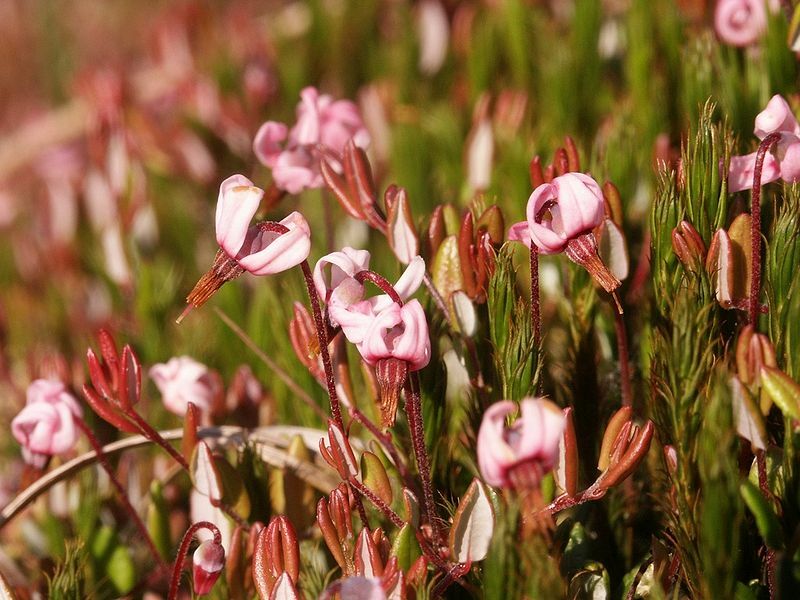 There are a few different species of cranberry and often their ranges intersect. The two most common varieties in the Atlantic region of Canada are Vacinnium oxycoccos and Vacinnium macrocarpon. The major difference between the two is the size of the leaves and the tartness of the fruit. The small reddish fruits ripen slowly over the summer and are usually harvested in the autumn after the first frosts in October. This shocking of frost develops the natural sugars and helps redden the skin of each berry. The cranberry has some interesting relatives. It is a member of the family Ericaceae which includes heathers, rhododendrons and blueberries. If you look carefully at the leaves you can see some family resemblance. The low growing plants produce horizontal trailing stems that can be up to 6 feet long. From that stem grow vertical stems of two varieties, vegetative or fruiting. The fruiting stems can hold up to seven berries. Cranberries are very high in antioxidants and are currently under investigation for possible health benefits to the cardiovascular and immune systems. It has also been found that the juice contains a chemical that inhibits the buildup of plaque on the teeth. Since 2002 there has been increasing interest in certain chemicals in cranberries that are beneficial in the fight against several types of cancer. Harvesting cranberries by flooding and corralling. 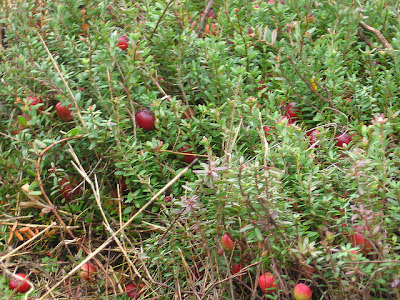 Cranberries are big business in many parts of Canada and the United States. The most common way to harvest is to flood the ripened cranberry bogs. Then a special machine threshes the berries off the stems, whereupon they float on the water. The berries are then “corralled” with booms, loaded onto trucks and taken to processing facilities. Other times the berries are harvested "dry" by the use of a cranberry comb that collects the fruit as it is dislodged from the plants. The fruits are then taken to processing facilities where they are cleaned of any unwanted debris and then packaged. Wet harvesting produces berries for juice or sauce; dry is usually sold as fresh fruit. Of course there’s nothing stopping someone from harvesting enough for their own personal use (just not from a commercial field!). Cranberries are quite common in wet clearings or along the flood edges of lakes. Just keep any eye out this spring and summer so you will be ready in the early autumn to pick. It takes little to no time to harvest enough for jelly at Thanksgiving time, or to make a litre of liqueur to warm you as the winter approached. Place the sugar and water in a saucepan, Bring just to a boil and then pour over the cranberries in a bowl or similar sealable container. Remove from the heat and mash enough to start to break up the cranberries. Add the rinds, cinnamon and allspice. Cover with plastic wrap and refrigerate for 1 week. After 1 week, strain the mixture twice through a fine sieve. I have found a new best friend in this process: a metal “permanent” coffee filter. It works quite well. Add the vodka, stir well and bottle. Place ice in a highball glass. 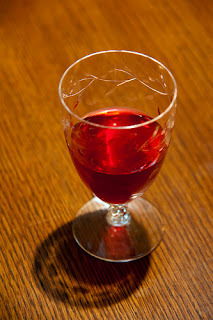 Pour vodka and cranberry into the glass. Fill with apple juice and stir. Shake together with ice and strain into a martini glass. 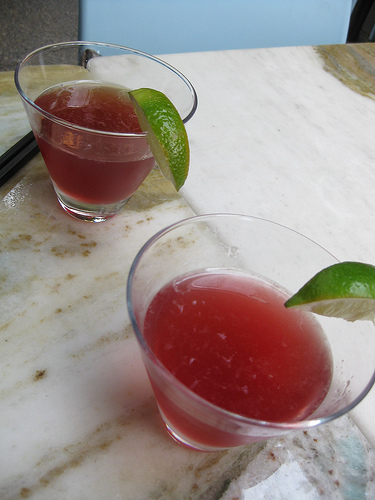 Shake with ice and strain into a margarita glass rimmed with salt.